UPDATE 9/22 - We’re giving away a pair of tickets on our Facebook page today! All you have to do is like and tag your music-loving friends in the comment section to be entered to win! Winners chosen 9/23 at 5 pm. We’ll have a few more contests giving away tickets to these exhibits so keep checking this page and Facebook! Iconic scenes from the frenzied, powerful world of music are now at the Arlington Museum of Art until October 18 as part of three exhibitions – Rock and Roll Billboards from the Sunset Strip, Backstage Pass: Baron Wolman and the Early Years of Rolling Stone and Austin Blues. As you walk through the front doors, you see the Foster and Klieser billboard hold up two giant chrome heterochromia eyes on the wall—the advertisement for The Who’s Tommy right on the back wall, making a statement now just as it did in 1972. Even today in Los Angeles, the music billboard transforms the landscape with enticing images of the day’s most current, popular and prolific artists like an outdoor art show set along hills and palm trees. Often hand-painted, photographer Robert Landau matter-of-factly started taking photographs of the billboards for fun one day and lucky for him, it turned into an extensive collection of nostalgia appreciated by art and music fans alike for decades. See photos of one-of-a-kind billboards advertising and immortalizing (for the moment) Donna Summer, David Bowie, the Beatles, Jackson Browne, the Eurythmics, Electric Light Orchestra (one of my favorites – in real life the billboard featured a real plexiglass space station), The Knack, Cher and a baby Bruce Springsteen to name a few. For those more interested in the artistic element that goes into creating the billboard, just around the corner in the exhibit is a tour de outdoor advertising, with antique photos documenting golden era signs for medication and other miscellaneous remnants from the trade’s origins. Good to know, music billboards are still alive and well. I was on the Sunset strip a few weeks ago, and new artists with digital billboards have taken the place of the intense art form of years passed. Maybe one day photos of those billboards in their heyday will show up at the Arlington Museum of Art. Not going to lie, I went straight for the upstairs exhibit. Before Rolling Stone was known as what it is today, it went around the country constantly following and documenting the milestones that made the classics immortal. 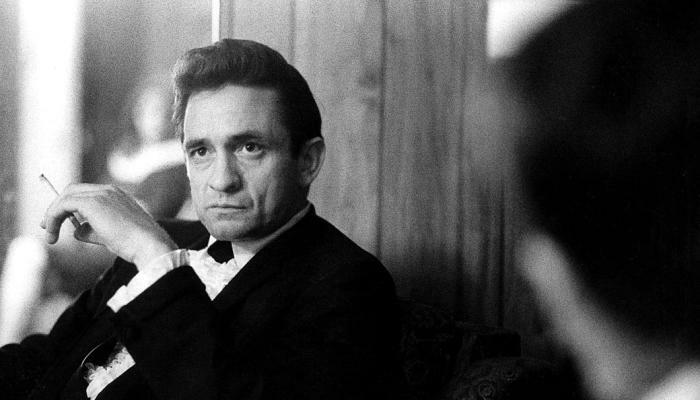 Walking up the stairs, immediately you’re stopped in your tracks by the man in black Johnny Cash in black and white, enjoying a smoke. An up-close and personal photo of a trailblazer, a true catalyst and legend in the music world accompanied like the rest of the photos by a short story about the photo, the photographic specs and the meaning of the work to the photographer, an honest tribute to the art of music photography. At some points unaware of the eventual significance of band rendezvous, introduction photoshoots, concerts and press events, Dolman’s photos serve as mute profiles to the artists. Intense and animated portraits of Jimi Hendrix (who Dolman said was the most photogenic rock n roll musician of all time), Grace Slick of Jefferson Airplane, an unknown at the time Pink Floyd blues greats like Muddy Waters, BB King , Lightning Hopkins and Mississippi Fred McDowel, and a baby Janis Joplin in her band Big Brother and the Holding Company. Intimate but crazed, all of the photos upstairs capture parts of the soul of a generation of prototypical artists we can only romanticize about. To accompany them, smack dab in the middle is a projector constantly rolling live concert footage and candid video b-roll of the original music festivals – I hate to be trite but I think footage of Woodstock was playing during my time in the exhibit. The most iconic photo burned into my memory from the exhibit was a blurry Tina Turner in musically-induced fury, dancing so close to Wolman you can see the sweat dripping from her face, performing in San Francisco in 1967. If you’re a fan of any of the musicians above, just a glimpse into the circumstances that led to the photos, some of the most popular of the artist, is well worth the trip. Up the elevator I went to the Texas-based gallery celebrating Texas blues musicians in Austin, Texas. Multi-exposure, gritty wide shots fill the white room with photos of Reckless Kelly in their early days, Maceo Parker, Willie Nelson and more captured by photographer Cassandra Weyandt. All in black and white, the top floor exhibit serves as a regional nod to the music lovers and makers that make the industry (most of the time) magic. Don&apos;t miss out on The Rock and Roll Wall of Fame at the Arlington Museum of Art, September 5 – October 18.